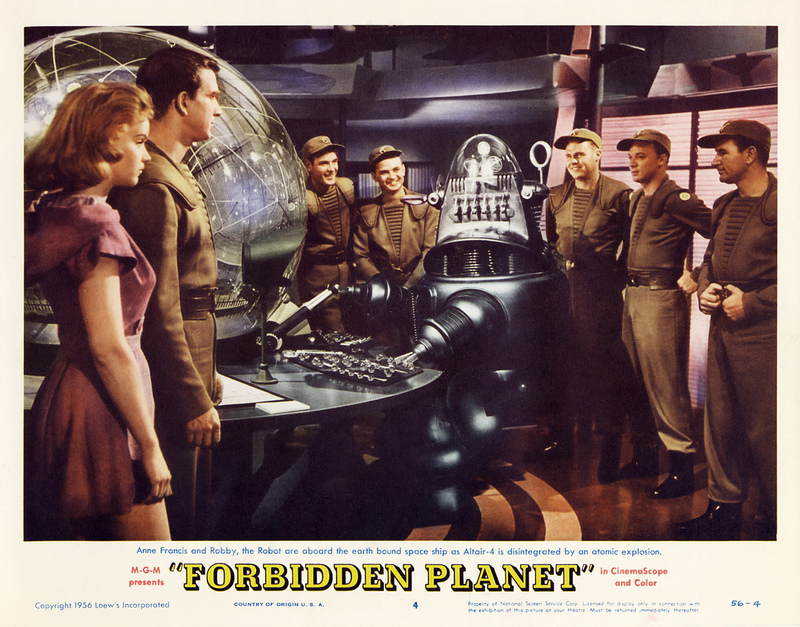 Forbidden Planet — first released March 15, 1956 — details a 23rd-century crew of humans on an expedition to discover what happened to a colony mission that went to an alien planet 20 years prior. There, they encounter the creepy archetypal Dr. Morbius and his lovable, amicable robot buddy Robby the Robot. As it turns out, Morbius is also investigating the disappearance of an ancient race of aliens called the Krell that left behind lots of insane technology. But they’re also trying to fend off some kind of horrifying monster that killed off the rest of the first colony mission. His outfit should be a symbolic clue about who the "bad guy" is in this story. Bits of this plot should sound very familiar to you. Not only is this a pretty straightforward version of Shakespeare’s The Tempest in space, but tons of contemporary sci-fi stories borrow many of these plot points. You also might recognize Robby the Robot (featured above). He’s made more than two-dozen appearances in other sci-fi media, including Lost In Space, The Twilight Zone, and Gremlins. Did we mention that he was fluent in lots of different languages decades before C-3PO shuffled his way into our hearts? Forbidden Planet also began the trend of exploring extinct alien races more than a half-century before Alien: Covenant basically recycled the same plot. In fact, just about every iconic sci-fi story you know owes it all to Forbidden Planet. In 'Forbidden Planet', the robot is the real hero. In fact, various bits of sci-fi technology we see in everything from Star Wars to Doctor Who have roots in Forbidden Planet. This is the story that coined ubiquitous sci-fi terms like “blaster” and “hyperdrive,” terms that most people associate with Star Wars. So the next time you fire up an episode of Star Trek, maybe give a respectful salute to Forbidden Planet for everything it’s done for science fiction.